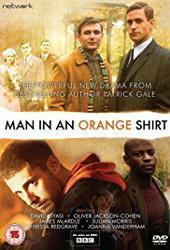 Description: Man in an Orange Shirt features two separate yet interwoven stories: Part 1 tells of the obstacles that Western society is putting into the love relationship of the two veterans Michael and Thomas in the immediate post-war period. Part 2 describes the trials and tribulations of 21st century partnerships, using the example of Michael's grandson. The stories are linked by Flora, as Michael's grieving wife and Adam's grandmother, whose unrequited love for Michael and conservative education results in a hateful response to Adam's coming-out. - Press CALL and he will buss you in. Sometimes this takes one or two more tries than the first one. - Upon entering make sure to go directly up the 3 flights of stairs to the THIRD floor then enter the hallway on the third floor. - Walk all the way to the RIGHT until you come to the Elevator which will take you from the third floor up to the eighth floor. His apartment number is 801. Call Fred at 415-377-7605 if you get lost.